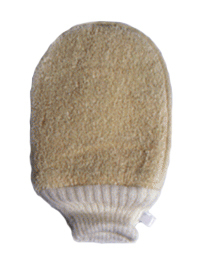 On one side this mitt is smooth terry and the other side is an invigorating exfoliating loofah. Natural. Hand wash. 8" x 6". Sold individually. 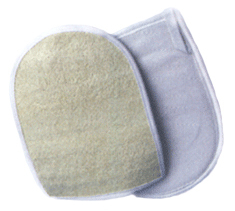 Ideal for sloughing off that dead skin and increasing blood circulation. Knit band fits comfortably around the wrist. Natural. 8" x 6". Sold individually.